As a young girl in Alabama, Wendy Hobbie had visions of success in the world of dance. Empowered by faith and motivated by the promise of hard work, she eventually set course for New York City to pursue her dreams. Soon she found that her journey would also include a valuable relationship with a staffing company. Meet the 2017 National Employee of the Year—and let her story inspire you. When you meet Wendy Hobbie, you’re instantly drawn in by her infectious smile and warm personality. 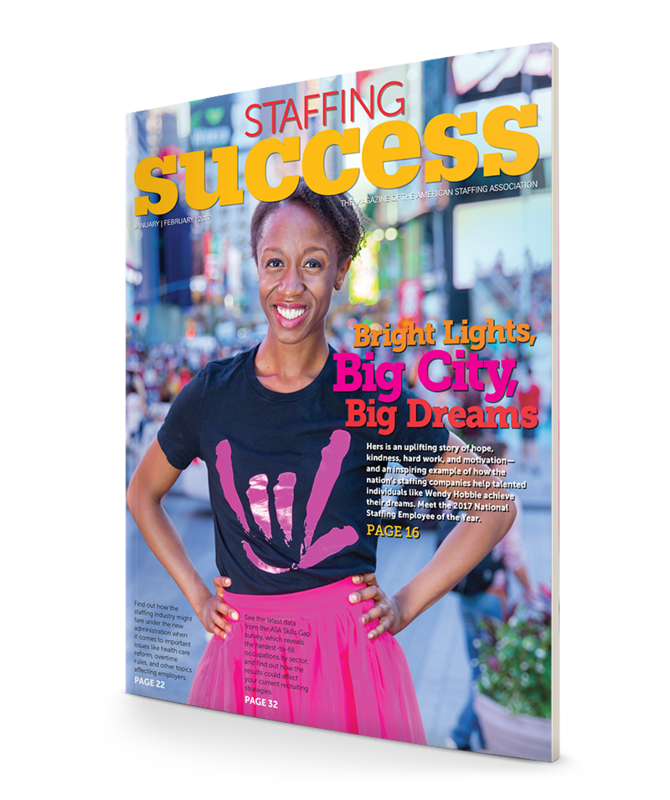 She’s energetic, sincere, grateful, smart, and talented—which is why Michael DiPeri of HMG Plus, the New York-based staffing company that employs Hobbie, was so thrilled to see her named 2017 National Staffing Employee of the Year. Hobbie “smiles with her eyes, and it’s contagious,” says DiPeri, who can also attest to her strong work ethic, reliability, and enthusiasm. DiPeri cheered alongside nearly 2,000 industry professionals as she accepted her award from ASA at Staffing World® in San Diego. Hobbie’s inspiring story begins in her hometown of Montgomery, AL, where she and her siblings were raised by a single mother in a home that was often short on money, but always had an abundance of faith and love, Hobbie explains.